Amber Sharples graduated from the University of Oklahoma with a Bachelor of Arts and a Master of Arts in Art History. She holds a Graduate Certificate in Museum Collections Management and Care from The George Washington University. Sharples joined the Oklahoma Arts Council staff in 2006 as Visual Arts Director after working as Public Affairs and Communications Coordinator at the U.S.-Mexico Foundation for Culture in Mexico City. In 2011, she was named Assistant Director. As Executive Director, Sharples works with the Oklahoma Arts Council board and staff to implement agency goals and objectives and responds to the needs of the state's arts community through financial support, services and advocacy. 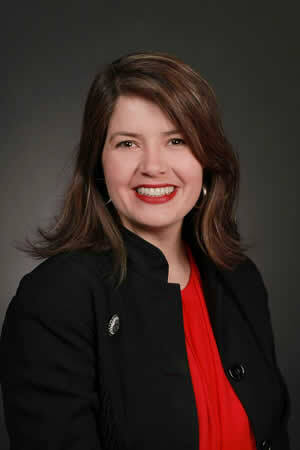 She serves on various boards of agencies, commissions and nonprofits, including: State Capitol Preservation Commission; Arts Standards Committee; Friends of the Mansion; Mid-America Arts Alliance; Native American Cultural and Educational Authority; and the Governor's Innovation Index Task Force.